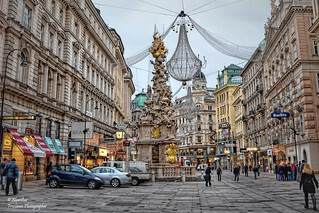 Der Graben ("the trench") is one of the most famous streets in Vienna's first district, the city centre. It begins at Stock-im-Eisen-Platz next to the Palais Equitable and ends at the junction of Kohlmarkt and Tuchlauben. Another street in the first district is called Tiefer Graben (deep ditch). It is crossed by Wipplinger Straße by means of the Hohe Brücke, a bridge about ten metres above street level.